Solar ovens were a main focus of our research prior to coming to Cape Town for a number of reasons – primarily that they do not require any energy other than the sun, which means there is no fuel cost involved. We contacted one company in particular, Sunfire, which produces and markets several kinds of solar cookers throughout South Africa. Their ovens produce a power output between 400-1000W of energy, but have a much higher start up cost that residents of Monwabisi could not afford: the solar ovens marketed by Sunfire range from R1600 to R2500 (Sunfire.co.za). Additionally, the stoves need to be aligned with the sun every 20-30 minutes for optimal conditions, so the person cooking needs to be actively paying attention to the meal. This makes the stove inconvenient for the user. 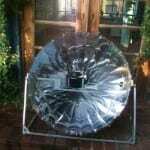 Another more economical solar cooker made by SunStove has also had trouble launching in informal settlements. Though the SunStove is much cheaper (at a price of R200), it does not readily boil water, making it is not nearly as effective as the Sunfire stoves, which can boil 1 liter of water in 15 minutes. The residents of Zimbabwe, where the SunStove was tested, also did not prefer it over their current stoves, making it not socially acceptable and hard to market.